Today, 1 November is Día de Muertos, the Day of the Dead in Mexico. So today I dedicate my blog to Frido Khalo who is both dead and Mexican, and an inspiration to fashionistas the world over. Frida Khalo, dramatic-romantic dresser, always made an impact with her personal style as well as her largely autobiographical paintings. I have always been attracted to her carefully constructed image which has been widely copied by boys and girls who want to capture something of her unique beauty. 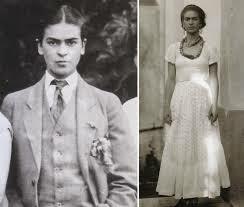 Fully aware of her natural beauty Frida passed quite convincingly as a man initially. Later as she formed an attachment to Mexican revolutionary painter Diego Rivera she self consciously adopted nationalist Mexican dress, choosing long frilled dresses with heavy jewellery. She had an ambiguous attitude to her sexuality – her inability to have children, and her physical disabilities and imperfections, intensified her introspection. Her personal tragedies, fraught relationship with her husband, and commitment to left wing politics, spurred on her creativity. Khalo put enormous effort into dressing and presenting herself almost as if she was a picture. Most of her detailed, painstaking paintings are of herself. Her fascination with her appearance, body and relationships produced an image which remains vibrant and inspiring 60 years after her death. 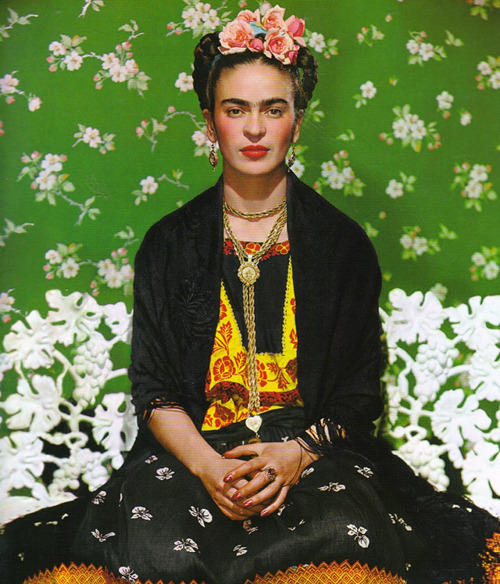 In this striking photograph, for the cover of Vogue magazine, Frida stares at us as we stare at her. Her look would be outlandish if she was not such an artist. She is dressed predominantly in black, a colour which emphasises her glossy plaited hair, strong eyebrows and slight moustache (both of these were mascared for emphasis), matt red lips and rouge. The combinations of patterns, both in her dress and in the background, are a feature of her style. The symmetric hair style with Iberian centre parting is emphasised by her habit of wearing fresh flowers and coloured ribbons in her hair, giving height to her 5′ 2″ frame. She wears the same heavy silver necklace in the photograph below. This necklace, and many other interesting artefacts, are on display at her home in Mexico, featured in the Daily Mail. Here a lovely blue and pink silk dress is complemented by strong pink ribbon plaited into her hair with red lipstick. In this photograph the earings, lace and centrally placed brooch creates a pleasing composition with more subtle colours. The leaves in her hair and purpley lipstick create a harmonious effect with the necklace and shawl, and with the lavender wall behind. If you are excited by this look here are some ways you can incorporate elements of it, without looking too out of place when shopping at Asda. if all else fails get a hawk. Or a monkey. Learning something new is always fun. Thanks Kate, she looks to be a very strong women,with heightened emotions… I must read more about her some day. Have you ever painted your face as a sugar skill?? SO funny, Kate. I just might get a monkey. 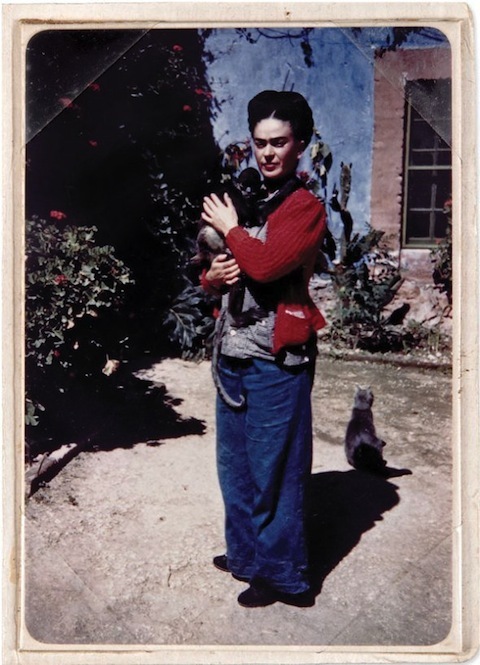 I’ve always admired Frida Kahlo’s style (and art) for the exactly the reasons you mentioned, such as its careful curation. There’s a consistent boldness about her that is difficult not to admire. Her continual mining of the self is appealing and I do love that she looks as if she could be a part of a painting. One of the disappointments of last year is that I had great plans to see her works at the L’Orangerie in Paris but we were running late and we showed up just as it was closing its doors! Your list of ways to incorporate elements of her style in one’s own look is very interesting and I particularly liked the mention of colour complements. I have had plans for a while to make a sweater inspired by van Gogh, using the colour complements that he so often used in his still life paintings in particular. 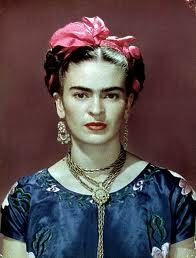 Thank you for a fab and timely article and great tips for a girl trying to find her own style, not just to copy Frida. The idea of accentuating one’s ‘imperfections’ is so obvious and yet so rare to see in practice. Instead we see women in the public eye doing the ridiculous in an effort to normalize the idiosyncrasies of their appearance. I suspect they wouldn’t do so if they were as sure of their talents as Kahlo was. I love Frida Khalo’s paintings. 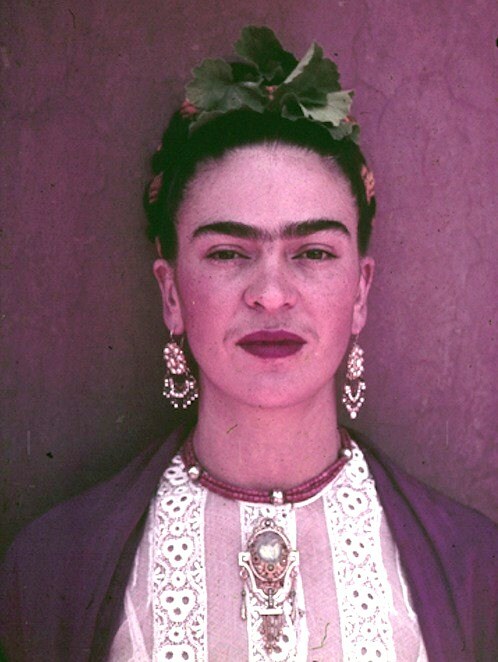 Love Frida! I will embrace my rather large chin and adorn myself with a dog that acts like a monkey. I definitely need a monkey!